And when you’re done with that, write it 100 more times. That ought to be an exercise for anyone considering running for public office. It’s been some 40 years since Watergate, which inspired that cliche, yet, incredibly, the Obama administration finds itself, almost two weeks before Election Day, trampling through the wreckage of its own careless cover-up. Obama and his people badly need to get momentum back on their side, but as long as the Libyastory remains unresolved, they cannot get back on the offense. And time is running out. The Obama-Libya fiasco is mind-boggling, especially when you consider the people involved:Barack Obama, Hillary Clinton and David Axelrod are famously capable political players. They know better than almost anyone how important it is to get out ahead of a bad story. Secretary of StateClinton could write a textbook on it, and I mean that as a compliment. Yet here we are, more than a month after the sacking of a U.S. consulate in Benghazi, and the story is bigger than on the day it occurred. It just keeps growing. Psychologists can no doubt pinpoint the initial instinct to fudge facts — to make bad news sound just a little better — but that doesn’t explain why day after day, week after week, this administration has failed to come clean and give a considered and definitive answer on what happened. That’s the only thing that’s going to make this story go away. I’m not talking about what happened with the attacks. That’s become fairly clear: There was a deadly terrorist assault on a clearly underguarded U.S. consulate on the anniversary of 9/11. 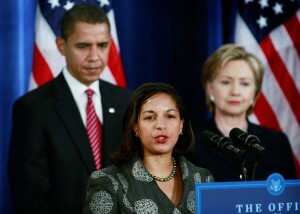 What needs to be explained is why the White House spokesman, the State Department and UN AmbassadorSusan Rice told the American public a tale about the nature of the attack for more than two weeks that doesn’t seem to be true, and that they may have known wasn’t true. What’s even more head-scratching is how President Obama and Vice President Joe Biden both managed to make the story worse in their respective debate performances.Everyone on the debate prep teams knew this question was coming, yet the president and vice president flubbed it. Indeed, they exacerbated it. They had an opportunity on a national stage to put this story behind them and both men kicked it back into high gear. The rest of this column is available at Newsday Westchester. Thanks for reading! Barack Obama didn’t stand a chance. The president was palpably better at Hofstra than he was at Centre College in Denver, but that pesky shadow — his actual record in office — continues to follow him onto the stage like a stalker. He cannot get away from it. It’s the 1,000-pound anchor dragging down his candidacy. That’s a nearly impossible task to get away with — even for a talented politician like Barack Obama. I always tell my clients that taking down an incumbent requires an indictment of his or her record. 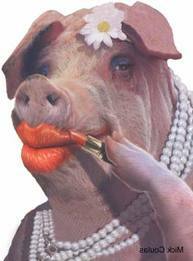 If you cannot make the argument why the current officeholder should be removed, he or she won’t be. Voters will always stick with the devil they know. Mitt Romney was a prosecuting attorney Tuesday night, and he had an overwhelming trove of evidence with which to indict the president. President Obama promised to have unemployment at 5.4 percent today. It’s at 7.8 percent — a difference of 9 million fewer jobs. He said he’s cut the cost of health care $2,500 per family. It’s gone up $2,500. He promised immigration, Social Security and Medicare reforms. Where are they? Gov. 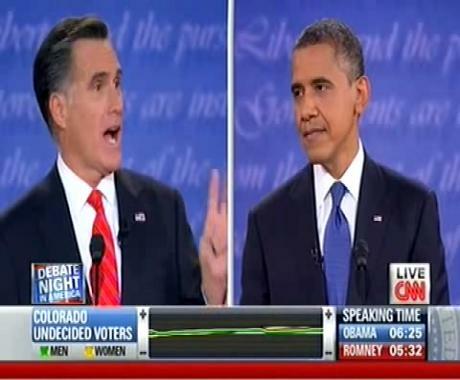 Romney was almost breathless at points, trying to work the ammunition at his disposal into his allotted time. That’s where the fight was unfair. There were no knockout punches thrown Tuesday, but a lot of body blows from the challenger landed. Romney also must have mentioned jobs, small businesses and the middle class two dozen times each — which is exactly what he had to do. The president had a prettier performance, but Romney was methodical, and he continued the indictment of the incumbent that he began inColorado. But it’s going to take a few days for that to become clear. For all the energy the vice president showed at the Kentucky debate — and God knows his ticket needed it — his “Saturday Night Live“-skit performance Thursday night obscured anything of substance said on stage — other than his charge that the U.S. consulate inBenghazi, Libya, never asked for more security, which appears to be untrue. That was news, and news has legs. Benghazi, and Biden‘s manic performance itself, are the two enduring take-aways from the debate, and neither will help theObama campaign in the stretch. Indeed, the first will serve as another distraction, a la Big Bird, and the second will further fuel the very serious investigation going on into whether the Obama Administration purposely sought to cover up the nature of and preparedness for the 9/11 attack in Libya. The prepackaged question on every pundit’s lips going into Danville was, “Can Joe Biden stanch the bleeding?” after President Barack Obama‘s lackluster performance in his first head-to-head with former Gov. Mitt Romney. That was the advertised bar for Biden to hurdle, and whether he cleared it had to be determined in the news cycle immediately following the debate. The consensus among the commentariat seemed to be “yes” — at least in the energy department. Biden demonstrated a passion in Kentucky that Obama lacked in Colorado. But he overdid it. By about 50,000 watts. There were times when Biden looked positively unhinged. “Is there some type of medication you might require, Mr. Vice President?” would have been a legitimate question in the debate’s opening half-hour. 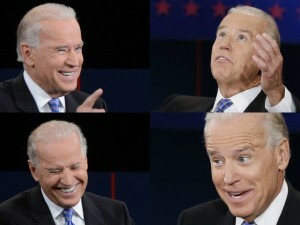 Biden’s doddering old uncle routine — you could almost smell Aqua Velva through the television screen — was no doubt meant to rattle the less experienced debater, but it became a sideshow in itself. Maybe that was done on purpose, too. Rep. Paul Ryan is a bright guy, but I can’t remember a word he said because of that split screen. Ryan could have explained how to divide the atom, but I, and millions of other Americans, couldn’t stop watching Biden’s “SNL” act. He was like the teenager hamming it up in the background of a live television shot. 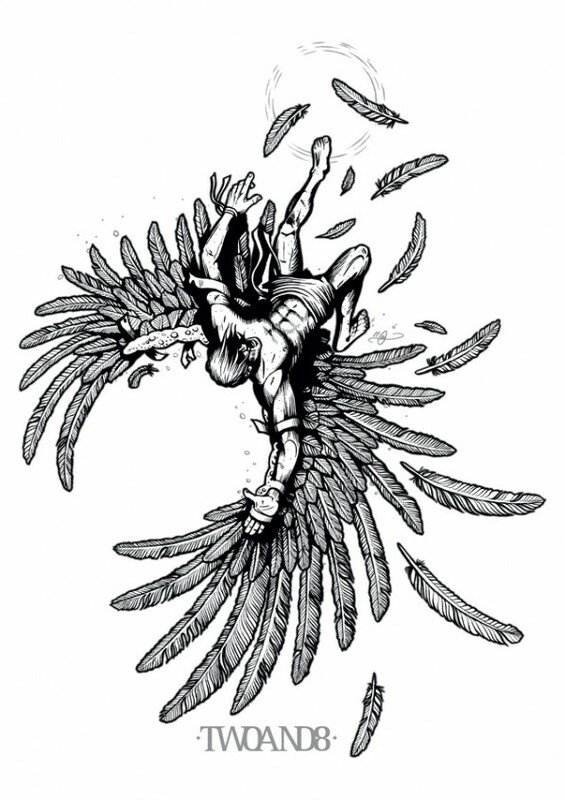 Remember the story of Icarus from Greek mythology? The precocious young man is given wings of feather and wax from his father, the master craftsman Daedalus. “Don’t fly too close to the sun,” the cocky youngster is admonished. But once magically plumed, Icarus’ soaring ambitions know no bounds. He flies higher and higher on the borrowed pinions — until the sun’s heat melts the wax away and Icarus plummets, head-over-heels, into the sea. Our modern day Icarus, President Barack Obama, now finds himself in a similar spiral. It wasn’t last week’s debate that tripped his descent. His wings were singed long before Denver 2012 by the harsh spotlight of governing. But the debate did serve to fix the president’s new position in the sky. It showed nearly 70 million attentive Americans just how far the great protagonist has fallen since Denver 2008, when he thundered like a deity between artificial Greek columns at the Democratic National Convention. It was bound to happen. Obama’s 2008 campaign was unfair in its promises. He ran as a virtual messiah. The upstart from Illinois was going to halt the rise of the oceans and heal planet earth. He was going to restore American respectability overseas and usher in an era of “post-partisanship” at home. Obama was to be America’s Philosopher King; he would be George Washington, Abe Lincoln, FDR, and Martin Luther King Jr. all wrapped up in one. Newspapers and magazines ran out of adjectives and metaphors for the wunderkind, just two years out of the Illinois state senate. I remember watching young people’s faces during 2007 and 2008 Obama rallies — particularly the faces of young African-Americans — and thinking how cruel it was to promise so much. They were mesmerized with hope at Obama’s rhetorical incantations. “We are the ones we’ve been waiting for!” he declared. Those words weren’t his, of course. They belonged to a Brooklyn poet named June Jordan who died in 2002, when Illinois State Sen. Obama was entering his third term. But how well they worked themselves into the cadence of an Obama speech artfully crafted for the teleprompter by his lofty writing team. Older voters who supported the president were, at least, better armed for the disappointment to follow. 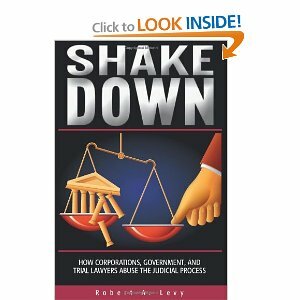 They knew — or should have known — the truth to those time-tested admonitions: What goes up must come down; if it’s too good to be true, it usually isn’t true; beware the door with too many keys. There are two sides to every story. But when trial lawyers get involved, a third instantly emerges — and usually predominates. Such is the case in a matter going to court in Westchester County later this month. Douglas Kennedy, a father of five and the son of the late U.S. Senator and Attorney General Robert F. Kennedy, will go on trial in October for charges of child endangerment and harassment over an incident that occurred at Northern Westchester Hospital two days after the birth of his son, Bo. Mr. Kennedy and his wife, Molly, wanted newborn Bo to get some fresh air rather than be cooped up in a hospital environment, where Mrs. Kennedy would be staying some extra time. Their obstetrician, who had admitting privileges at the hospital, said that was fine, and Mr. Kennedy, Bo in tow, walked to the elevator. There, father and son were confronted by an officious and I’m sure well-meaning nurse — this is all on video tape — who tried to prevent the pair from leaving, citing hospital regulations no doubt created to protect against lawsuits. Mr. Kennedy, according to news reports, informed the nurse that his wife’s doctor had okayed the excursion and headed to the staircase when the nurse physically prevented the elevator from leaving. There, according to news reports — the video fails to catch all of this — a nurse tried to physically remove two-day-old Bo from his father’s arms, and Mr. Kennedy reacted to protect him — the nurses said he lashed out — resulting in Mr. Kennedy and a nurse each falling backwards. The infant boy thankfully was not hurt. What happened in that moment off camera is what this trial will ostensibly be about. A document from the law firm representing the nurses filing the criminal charges against Mr. Kennedy clearly suggests that this case may be more about money than about criminal justice. In a proposed settlement agreement, The Taub Law Firm offered to have the attending nurses drop their criminal complaints against Mr. Kennedy if he would agree to a plea resulting in community service — and “a monetary settlement…commensurate with each nurse’s physical and psychological injuries, pain and suffering, and particularly post traumatic stress disorders.” The nurses would agree to keep the settlement amount strictly confidential. That last point seems especially magnanimous of Taub, seeing that it would receive up to a third of that confidential settlement amount. There are other demands in the Taub document — downright laughable ones — involving Mr. Kennedy issuing an apology to the nurses live on The Today Show and “collecting garbage daily in Mount Kisco or Chappaqua for at least two weeks.” They presumably forgot to include three trips through the spanking machine for good measure. Bo’s dad apparently refused this largesse, because he is defending himself in a criminal trial in Mount Kisco Town Court on October 22 at 9:30 a.m. It should be quite a show. After that, he will be sued by his accusers in civil court, according to news reports. What I can’t figure out is why anyone claiming physical and psychological injuries and pain and suffering so severe as to cause post traumatic stress disorder (! ), an injury most commonly associated with combat trauma, would have been satisfied with the accuser picking up town trash — if he would just fork over an undisclosed sum of cash, too. But what stinks even worse to this observer is that charges of endangering the welfare of a child — against that child’s own father — would be used to leverage a hush-hush financial payout. The fact that it would be done to someone from a prominent American family, who presumably would want to protect his family name, makes that part of this story all the more egregious. Weird things happen in life, and this whole incident probably could have been avoided — and settled with some simple apologies all the way around. But then the trial lawyers got involved. Welcome to our world, Bo. 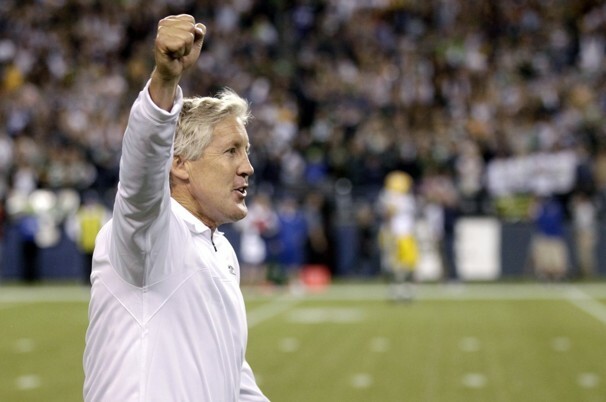 Seattle, WA — Tuesday, Sept. 25: Seattle Seahawks coach and executive vice president Pete Carroll today called upon the NFL to reverse the game-ending call Sunday that gave his team a 14-12 victory over the Green Bay Packers at CenturyLink Field. Wouldn’t it have been great if Pete Carroll had sent that news release the day after the botched call that unfairly gave his team a victory? In other words, Carroll, who undoubtedly reviewed the play like millions of other Americans, condoned the lie of a win and ran. And that is perfectly acceptable in American sports. Why do we raise our children to be virtuous, press them into playing sports, which gives them so many benefits — chief among them the quality of sportsmanship — and then teach them to lie en masse when an unambiguously incorrect call favors them or their team? That’s true. But in cases this clear, does that make it right? When I was a kid, I was given a book of football short stories. In one story I’ll never forget, a high school glockenspiel player in the school band is discovered to have an arm like a cannon when the football sails out of bounds, and he fires it back onto the field. Within a week, he is transformed from bespectacled band nerd to Big Man on Campus — the letter sweater, the cheerleader girlfriend, contact lenses, the whole thing. As quarterback, he leads his team to victory after victory. Then, in the state championship game, with time expiring, he tiptoes 30 yards down the sidelines for a score. The referees stand with theirarms signaling touchdown. The home crowd is delirious. The pretty blonde cheerleader grasps the player’s school ring hung on a chain around her neck and cries tears of joy. All is bliss. Except in the heart of our hero. He and only he knows that he stepped out of bounds on the 15. What to do? A lot of Americans are down on their luck these days, but few have had to endure the unexpected knocks of life that Kevin Lawler has over the past four years. Two-thousand-eight was to be a promising year for the Rockland County, NY husband and father. That was the year the former Merrill Lyncher opened his own financial services firm. Two months after its doors opened, world markets collapsed. Mr. Lawler’s family’s life savings were soon after stolen by a Ponzi schemer — they lost virtually everything — forcing him and his wife to sell their homes — just as he learned that he had Multiple Sclerosis, severe bouts of which took away his ability to walk and speak. He fought back time and again in a physical rehab center to re-learn how to walk, only to find out last year that he had Stage Three cancer, all at the age of 51. Mr. Lawler, the father of a work colleague, is seen speaking here at a church in Piermont, NY. Strikingly missing from his remarks is any hint of bitterness. Indeed, he exudes an utter sense of serenity, far more than so many of us with jobs, homes, and good health do. I’d appreciate those of you who get something out of Kevin’s talk to pass it along. He and his story are worth more people knowing.